Had a pair ready for my next Morocco trip but sadly they didn’t fit the rack/pipe combination. So back under the bed, ready for next time. I bought a pair of Mag IIs and used them in Morocco (left). I finally got a chance to actually use my Magadans for a few weeks’ ride around the Southwest USA recently. Admittedly it was only America and I was mostly moteling, but I did enough off-roading to put them to the test. Full story on that ride here. I am pleased to say – but not surprised to learn – that the Mags lived up to expectations. It’s only a bag, but the no-nonsense design is simply functional and effective – like the Steel Ponys below but much better construction and materials; there’s nothing there you don’t need – other manufactures take note. Mine were actually semi-permanently mounted on prototype Al Jesse platform racks – with each siderack removable, so I either pulled out the liner to take inside – or removed each side rack where that felt a better idea – or for day rides. More news of the Jesse MonoArm racks in a few weeks. It never poured with rain but it did when I used them last year so I have no reservations about that aspect. The corner tabs I added on not so elegantly (see below) may become a feature on future versions. For my sort of riding prefs they’re the best thing out there. ABR magazine recently compared half a dozen soft bags. Highest score? Magadans. Preamble With no one making anything that suited my needs, a few years ago I decided to make myself what I considered the optimal overlanding set of soft bags. Up till then I’d used Oxford Sovereigns (the best there was at the time – 15+ years ago), some Andy Strapz Pannierz briefly, Touratech Zega Flexes, Enduristan Monsoons all while eyeing up some Steel Pony Gascoynes (right). They seemed to be the pattern to follow: a big-volume, zip-free throwover keeping the mass of weight low and forward and in one bag with a pair of outside pockets. Only I wasn’t convinced by the merely water-resistant fabric or indeed, rack-free mounting. For over landing loads a rack is the way to go. Around then I’d discovered Hypalon rafting fabric which would easily answer both crash durability and wet-weather impregnability, if not even slash proofedness. 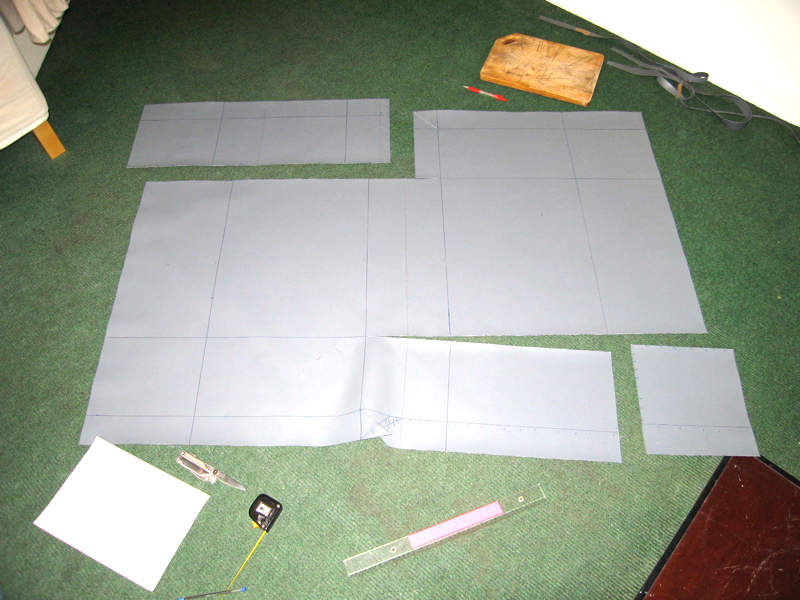 I drew up a template based on roll widths and got as far as taping together a mock up. The problem would be doing a good job hand gluing the one-piece panel into a box shape. The idea stagnated and no one I approached was interested in developing it until I lately realised better to separate the durability from the impregnability: use any tough sewable fabric for the outer, just as long as the lift-out inner was a tough, PVC roll-top liner. Sewable fabric like Cordura or canvas can readily take pockets and tabs which would have to be glued to Hypalon. In my experience from gluing Hypalon and similar fabrics on my boats, sewing is easier. Along with other ideas I’m testing out on my GS500 project bike, that was to be this summer’s job once AMH6 was wrapped. 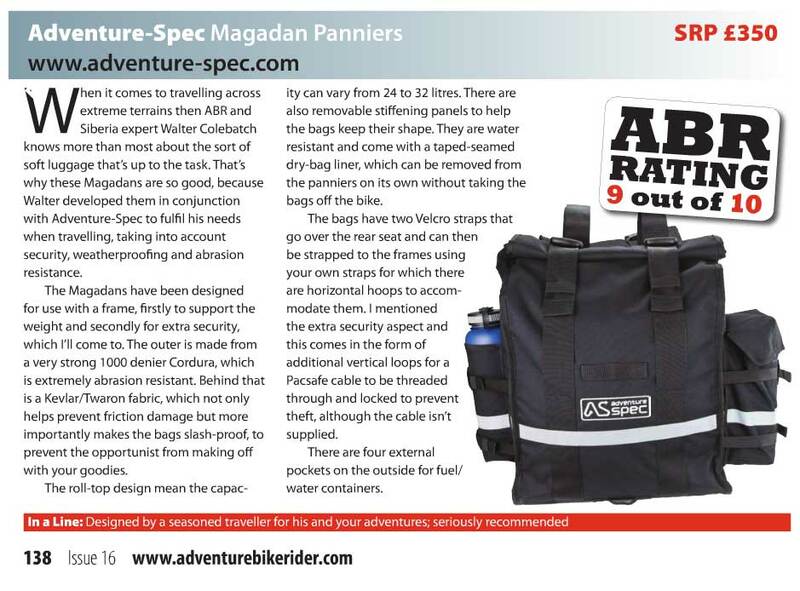 Then Adventure Spec’s Magadan Bags cropped up, designed by Water Colebatch following his rides in the Russian Far East with (AFAIK) a set of Ortliebs and later Gascoynes. Here was a bit of kit designed following months of hard riding in the field. 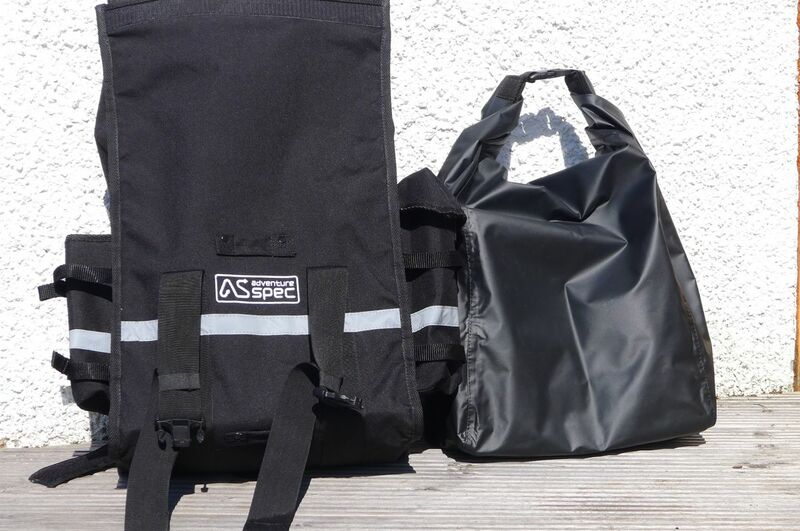 These bags were supplied to me in exchange for an Adventure Spec advert in my AMH6. The Mags are based on the proportions on the 36-litre Steel Pony Gascyones Walter C used or my design if you include the pockets and which I feel is near perfect: bigger than the Andyz, narrower than the Monsoons, zip-free closures unlike the Zega Flexes, and with a chunky lift-out liner supplied unlike any of them. Two layers of regular-looking (PU-coated?) Cordura make up all the panels of the outer bags, joined with a thick edging. Can tell if one is or incorporates the mysterious and slash-proof Twaron, but one has a ‘ripstop’ like appearance in the weave although it’s possible I may have felt the thin later of Twaron between them. Inside, as with many soft bags, a flexible panel behind a zip slips down the back panel and under the base to give a bit of shape while still retaining two panels facing the bike or the rack. 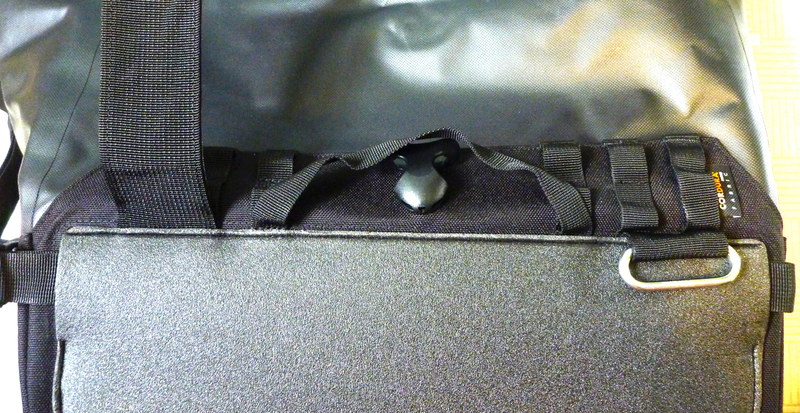 Magadans are designed to be used against racks, as many other soft bag makers are beginning to realise. 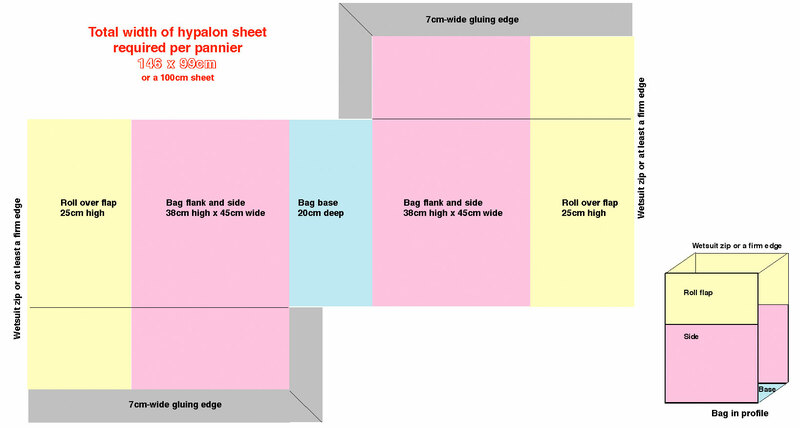 I made the dimensions about 24 litres rolled up with two folds (left image above) – the regular way of using them. 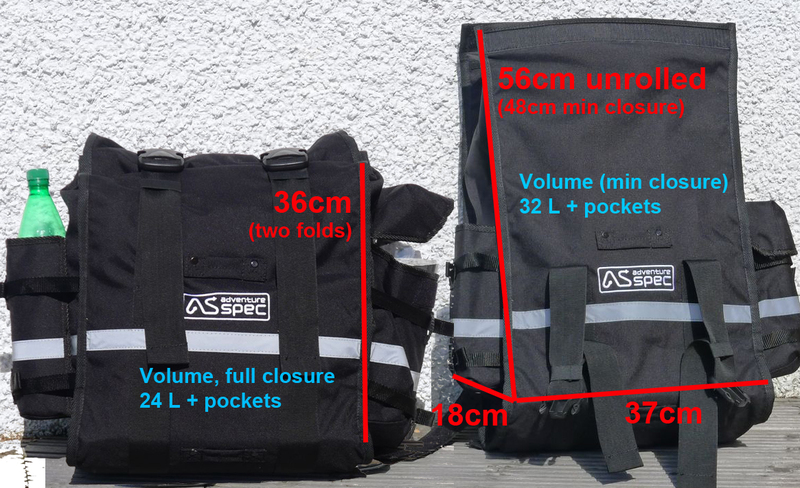 In what I call expanded mode, with just one, less weatherproof fold on the velcro’d top edge of the outers, you can get 32 litres in each side plus 3 litres in the pockets. They weigh 4.7kg (10.3 lbs). The Gascoynes are about the same size but are 23cm wide – an extra two inches giving another six litres in the main bag. However, I’m happy to lose that extra width. The outer rolls up with a velcro closure and two chunky clippy clips incorporating enough slack to still work in expanded mode, or to lash things down on top with the bag fully rolled up in regular mode against the weather. The two outside pockets are a great idea to keep fluids handy but also out of the main bag. It’s what’s always missing on vinyl Orliebs and something I’ve bodged on myself on other bags using army ammo pouches. Both with velcro flaps, one will take a 1.5 litre water bottle (green bottle) sticking out, or 1 litre flap closed; the back takes 2 litres sticking out with room to spare, or 2 litres closed. The weight is taken on throw over straps, but as mentioned, with a rack. 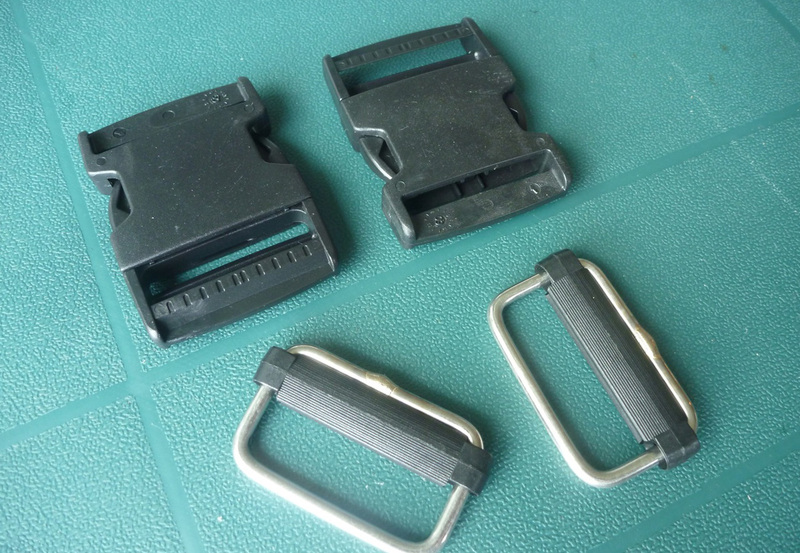 One bag gets doubled velcro ‘hook’ straps (4), the other gets the double sided ‘loop’ strap. 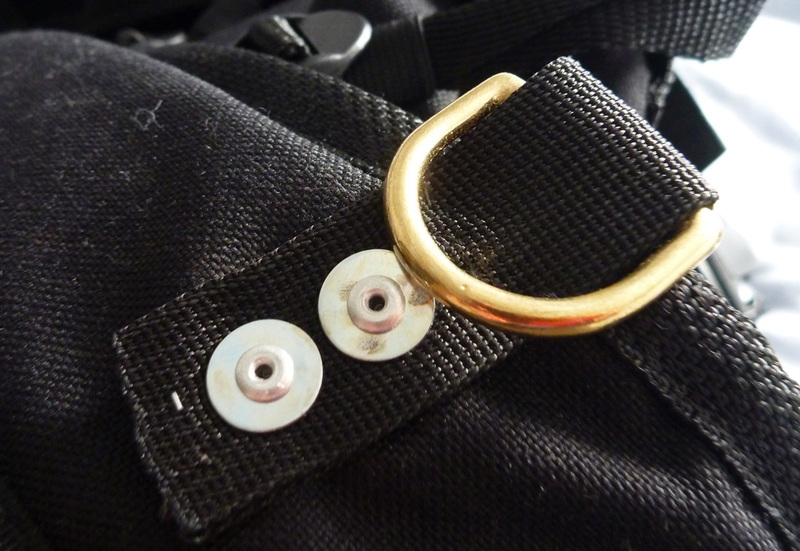 A secure system sandwiching the loop strap from both sides to cope with the large hanging volume and onto which velcro can be re-sewn should it wear out, or a buckle easily fitted. With velcro the less you use it the longer it will last but with a buckle (two types shown right) macro adjustments up or down are much easier to make, especially when the bags are loaded. That’s what I plan to do. The distance on full velcro overlap is 50cm and I’d say you could run them out to 75cm (half overlap) if you’re bike is wide. 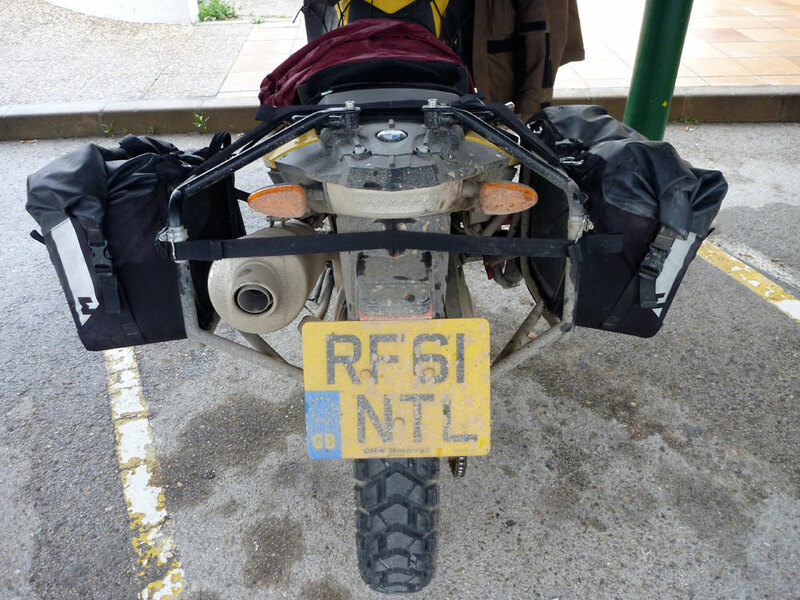 ‘We have always found that tags sewn onto panniers result in [them being] ripped off panniers as soon as there is any real load applied or a constant tugging or pulling. 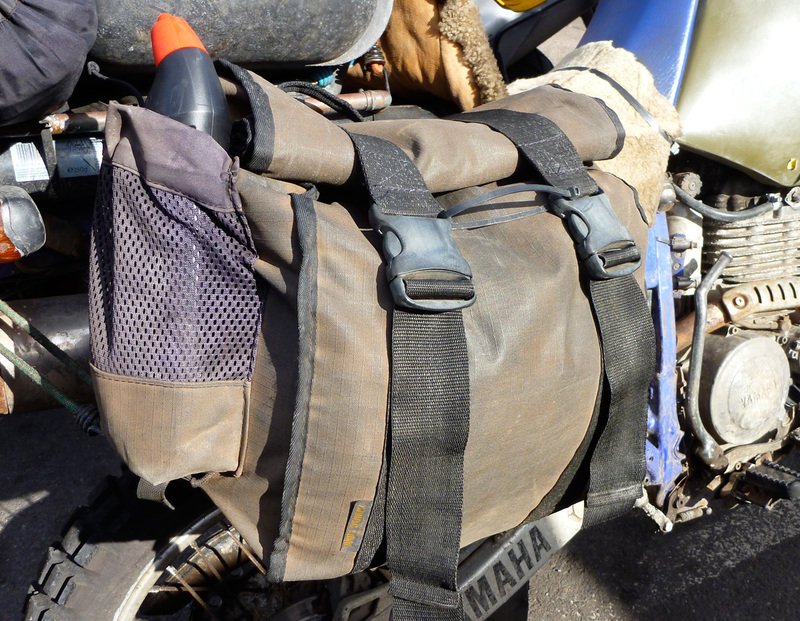 The Magadan panniers are designed to have a strap tied around the entire pannier and then around the frame. There are slots in the front and rear bottle holders which allow the strap to pass through to help hold everything in place. I have to say that from my experience with similar panniers that’s not such a convincing explanation. And even if it was, a tough fabric mount could feature a ‘sacrificial’ ring or loop which could be replaced should the pannier be wrenched away in a heavy fall. But if that’s the Magadans’ biggest flaw then it’s not so bad. 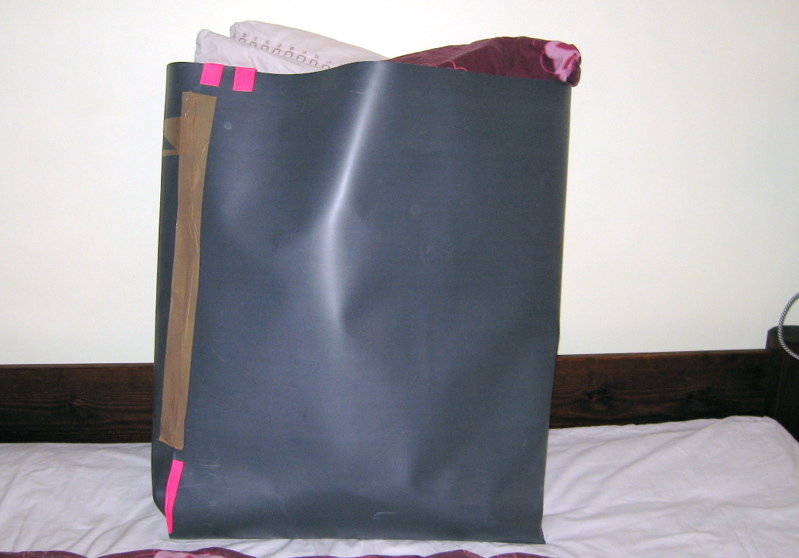 I was pleased to see the inner bags are not some cheap PU-coated drawstring stuff sacks, but full size, roll-top PVC ‘dry bags’ shaped to fit the outers. Sewn seams are taped (right). I suppose I’d have preferred heat welded, like an Ortlieb or Seal Lines. The great thing with separate bags is you can lift them out clean to carry into a tent or hotel room, leaving the mucky outers on the bike if you wish. These are chunky PVC bags that will resist the rubbing against the outers as well as impacts better than most things, and anyway, you can fit a selection of your own in there to compartmentalise better. As well as the horizontal back strap to locate the bags, the Magadans feature a similar arrangement of loops to take a vertical strap or indeed an adjustable cable lock to wrap around a frame – where used – so securing the bags against opening or removal. Combined with the slash-proof fabric, this ought to make the Mags the most secure soft bags around. It’s hard to know how effective this slash-proof Twaron is without doing the obvious. 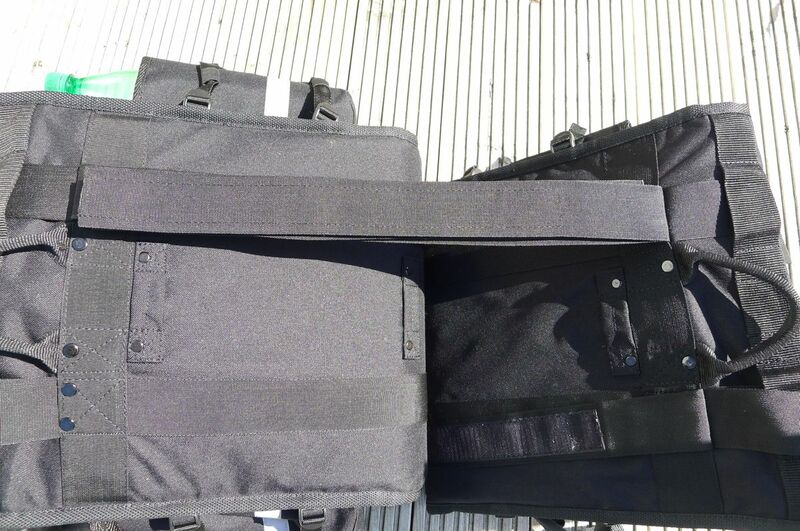 There are a couple of vids on youtube citing the wonders of Twaron for offshore and ballistic uses, but if nothing else, if you use a rack you’ll be able to cable the bag on (although you could sort of do that with any soft bag). All up I’d say the Mags look the business: a great size, good features and modifiable for rack fitment. The quality of manufacture (somewhere in the EU) looks good too. Nice work Walter C and Adv Spec; you’ve save me doing a less good job myself. There’s more on using the Magadans here and here. 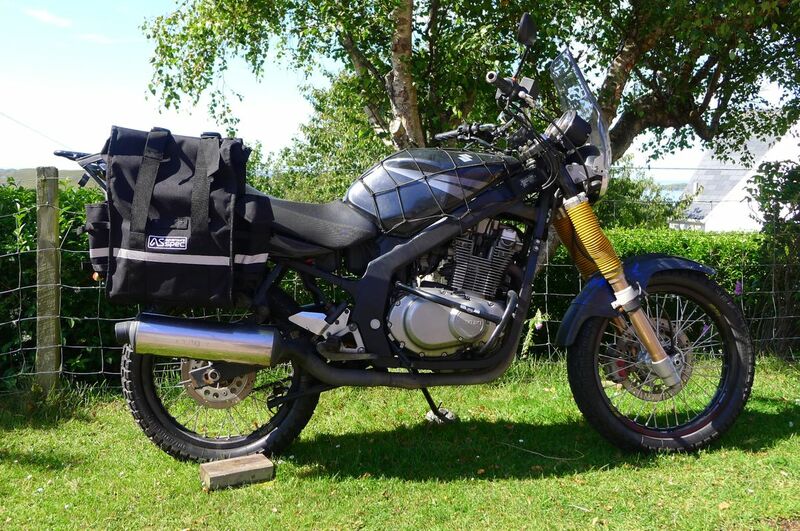 With Monsoons costing £220, Kriega Overlanders from £500 all up, Steel Pony Gascoynes AUD350 (~£240 + shipping and tax) and Andyz going for £245 in the UK, at £350 I’d say the Magadans are fairly priced when you think what a key component your luggage is on a genuine overland trip. 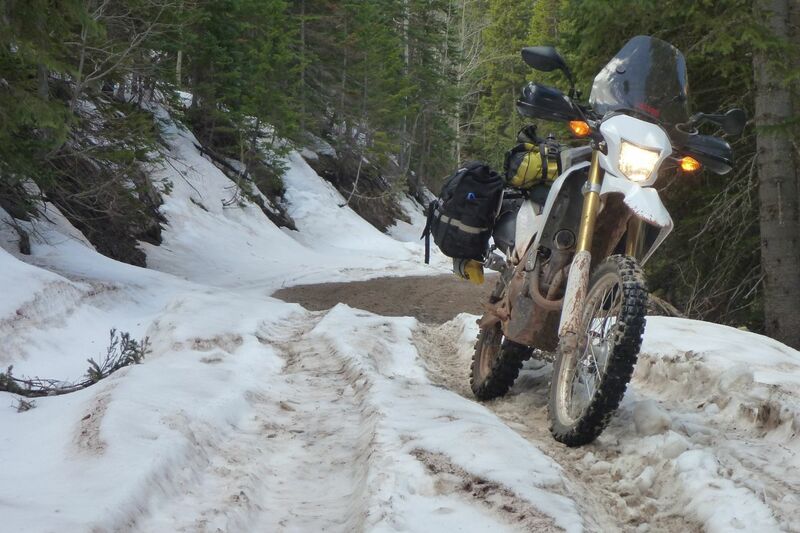 This entry was posted in Adventure Motorcycling Gear Reviews, AMH News, Luggage, Project Bikes and tagged Adventure Spec Magadan Bags, Andy Strapz Expedition Pannierz, Enduristan Monsoon, Giant Loop Siskiyou Panniers, Jesse Luggage Systems, kriega overlander, Magadan bags, Steel Pony Gascoyne, Touratech Zega Flex, Walter Colebatch. Bookmark the permalink. Has anyone come across these? Moto Bags from Italy – I am seriously considering them! One thing I do not understand: Frames! Why do you bother about one or two inches extra width of bags and then strap them onto wide frames? I have been using Ortliebs on my KTM 640 Adventure without frames for years and now I’m using Monsoons on my 990 and my brandnew 690 – without frames as well! IMHO the problem are long bags rather than wide ones, since it’s nearly impossible to keep them off the mufflers. On my old 640 nothing was required at all, but the new bikes require heat shields. I use the Giant loop Hot Springs heat shields, which works great with the Monsoons. So why are you using those bags with frames? I think the most important advantages (low weight and narrow shape) are lost that way. Or did I overlook the obvious? I agree: Being pushed off a cliff edge is a pain! But for me this leads right back to my initial question: Is that the pannier’s fault or the rack’s (as you said yourself: “unlike the rack I used on the loan BMW with the Monsoons”? 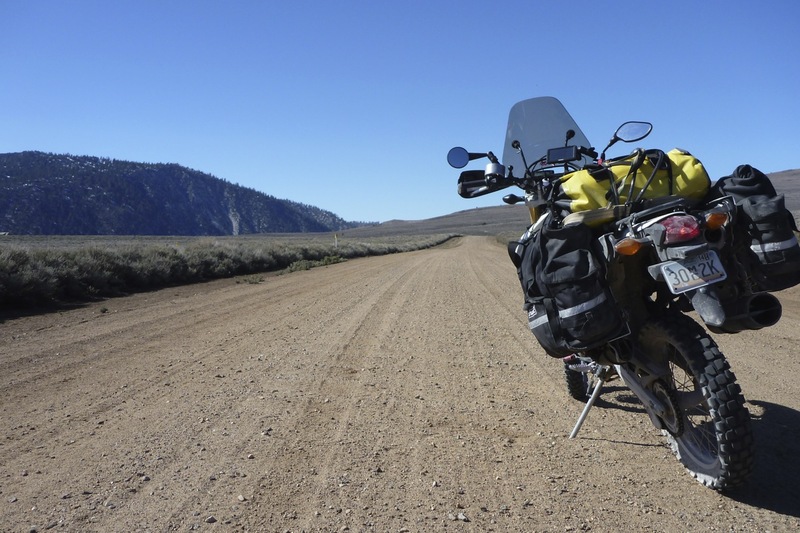 On my 690, the panniers are barely wider than the handlebars and I never experienced being pushed off a cliff here in the Rockies – but may be the Moroccan mountains are also a bit different than the Rockies – unfortunately I have never been there so far. 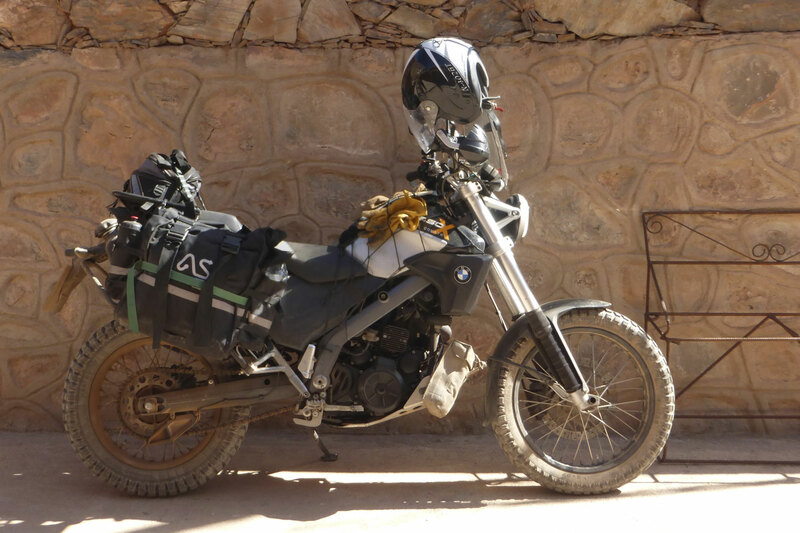 Hi Paul, I will be the first to admit the Monsoons + standard Metal Mule rack + BMW 650 twin was a bad combination for width in the mountains – but it was what I was given/lent. The GS’s underseat tank makes it wider than normal bikes, its OE silencer is huge (many replace with slimmer pipe and Mule make a slim can rack), + the slightly wider than average Monsoons didn’t help. Hi Art, when it comes to long-term durability, I think everything has to be repairable and maintained. How easy and effective that is is the key. As mentioned somewhere, I’ve used Ortlieb panniers and roll bags on arid Himalayan cycling trips and roll bags on moto trips too and have no complaints; the fabric is pliant and with bombproof welded seams + the rolltop seal works well enough. 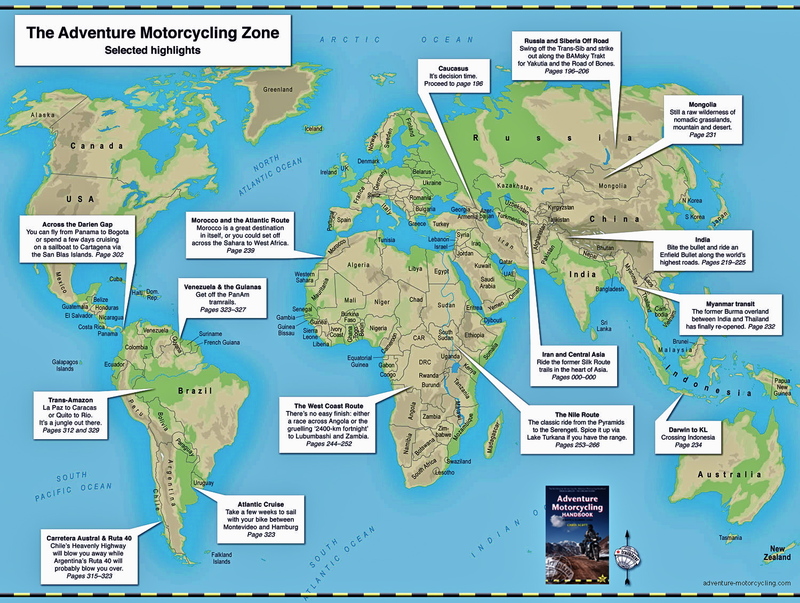 But the moto range of panniers have always been a bit small and under-featured for overlanding. IMO the mass of the weight wants to be low (on the sides) but not too wide. I believe Walter C used Ortlieb panniers (moto + cycle to gain volume) before turning to Steel Pony and finally designing the Magadans. One problem with Orts is the fabric deals with abrasion and proofing and it seems it doesnt take to exterior pockets. They are very useful but possibly too much strain on Ort fabric/design? (I see Ort have now brought out a Bottle Cage to mount outside panniers – how is unclear – poke holes and seal?). I was a bit disappointed when the Speedbags came out. To me they looked designed for upswept low-pipe sports tourers; too shallow top to bottom and so way too small. Plus I rather doubt that each side is 23L in volume as stated, more like 15 if you round down 23x15x50 (Ort listed specs) due to the half cylinder shape. Of course that volume may suit your super lightweight DR set up just fine. The thing with Ort pans is how they deal with the abrasion of a bike pressing down on them as it slides down the road. Will they glide or will they melt and wear through. I never found out, though that’s a tough test for any soft bag. My beaten-up cycling Orts have many years left in them and with some Aquaseal anything can be repaired. 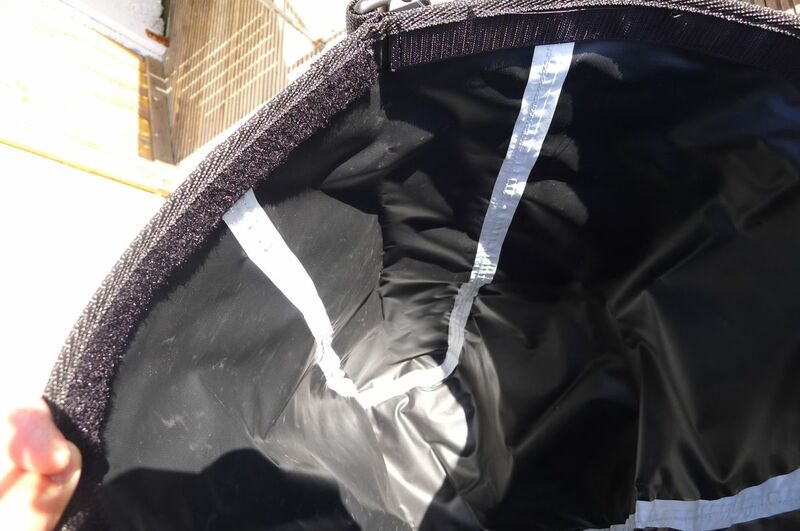 I’m not familiar with the D-Fender but remember being a bit leary of Tizips when they cropped up on other Ort products, specifically the Duffle Bag a mate was considering as over a UDB (see below). However on tizip.com it seems that they come in various grades, including suitable for dry suits. The zips that merely press a rubbery band together I’m not so sure about; they may work for ‘static’ uses like baggage as opposed to clothing. Then you have to deal with daily use and dirt which is tough on any zip. People like zips because they’re strong, easy and convenient but to be submersion proof (to me, true waterproofedness) they have to be like the brass BDM zips on my kayaking drysuit or Watershed UDB. Stiff to operate even with beeswax lube, when I’m tired I can hardly open my drysuit so far from convenient for regular use. Watershed’s regular bags (not the UDB) have an ingenious giant rubber, ‘ziplock’ seal – breaking it open requires a quick knack and a spray of 303 lube once in a while. They’re also submersion-proof to the point of being buoyancy aids. It depends where you travel, but for stuff you simply do not want to get wet (or no wetter than what you put it in), something the 25L Watershed Chattooga does me. I had one pinched with a tent, bag, mat with chair, s-bag and tarp inside. Sat on the back of my bike I knew the contents wouldn’t get wet. I’ve since bought another Chat. Your D-Fender could of course benefit from a roll top dry bag inside should it leak. That’s what I did until I started using Watershed bags (on the water + on moto). Yet to test my Magadans in a day-long downpour. Thanks for this–your tips and insight is appreciated. I will, at some point, load up one of the Speedbags and compare capacity to a 20 l dry bag that I have and for what it’s worth, I will let you know. I share your opinion on expernal pockets for frequently needed items. 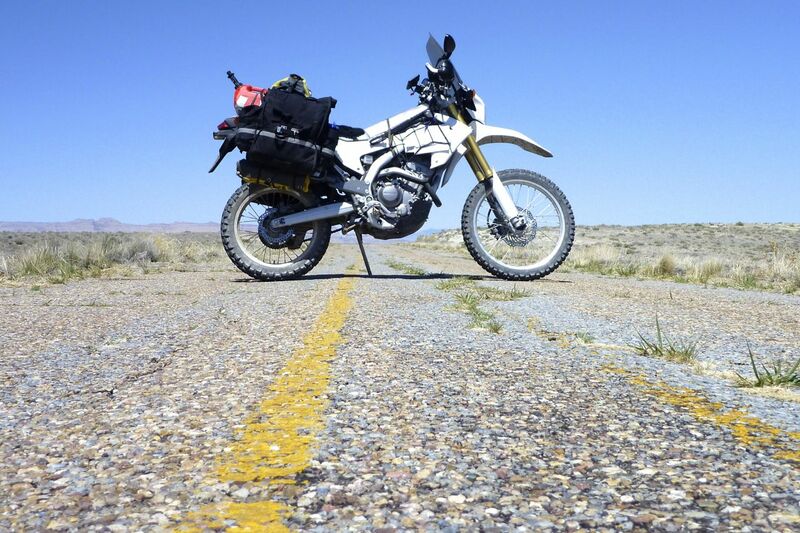 For these reasons, I became a fan of tank panniers and used Wolfmans on my KLR650 for years. 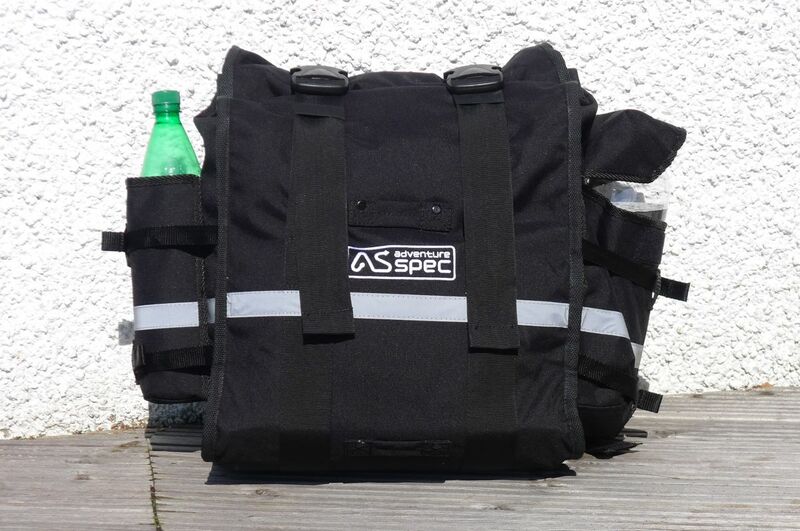 There is nothing out there that I am aware of, that offers a roll-top, waterproof design, although Andy Strapz has some that look good. 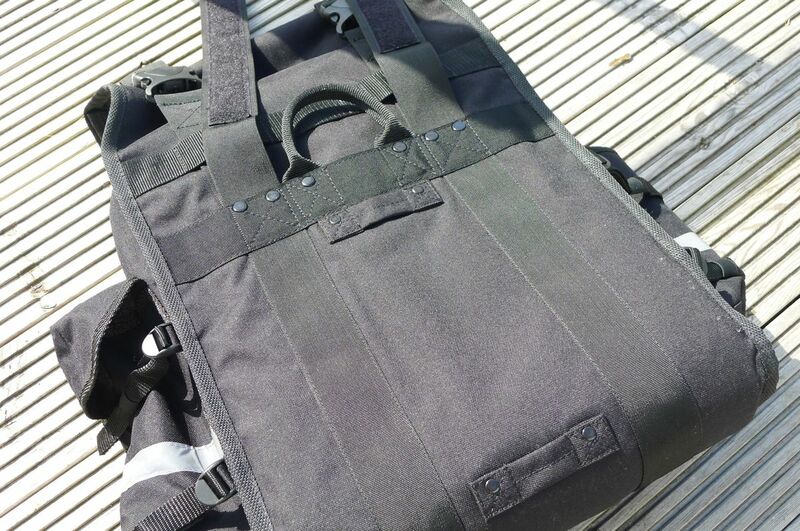 Wolman does now have a modular “Rollie Bag” line with optional tank fitting straps but Wolfman stuff is very “fiddly”, in terms of fitment, which I just hate–hence, out of all the stuff that I bought from them in the past, I only ever used their tank bag and tank panniers. Looking forward to the new edition of AMH–I have allready ordered. I have currently outfitted my DR650 with soft bags, so appreciate your research and testing of what is out there. I went with the Ortlieb Moto series 46 litre (combined) Speedbag saddlebags and the 29 litre D-Fender tail bag/back pack. I want to set-up very lightweight and narrow to the bike and the Speedbags are certainly that, although I am currently working up in Northern Alberta, Canada, so haven’t had opportunity to test them out yet. Not sure about long-term durability of the Ortlieb stuff for Overlanding but we’ll see. Fortunately, duct tape and silicon sealant/glue will be an easy “in the field” fix if they wear through due to abrasion. As far as the zippered entry of the D-Fender bag, I will have to find out too but issues of convenient access prompted me to give them a go.